Dell's own giant Android tablet-like gadget is about ready to make itself known throughout the world especially when it's packing a customized Android experience that's fitting for its gargantuan 5” display. Originally going by the Dell Mini 5 name, it happily reverted to the Dell Streak which is now looking to launch exclusively with O2 UK first with roll outs to other European markets soon afterwards. However, US consumers will have to wait some time as it's been given a launch time frame of “later this summer” – so we'll have to sit tight and watch our friends over the big pond get comfy with this sleek device. 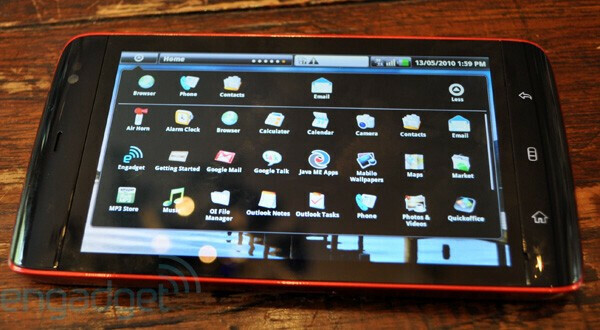 Although it's not being positioned as a smartphone, especially with its pocket busting dimensions, the Dell Streak is marketed as “the ultimate portable tablet PC.” Interestingly enough, it would seem apparent that this could potentially be Android's answer to Apple's iPad – especially now more than ever with its heavily skinned customized Android experience that's sure to take advantage of its larger real estate. For those not too familiar with the device, it features a 5” display, 1GHz Snapdragon processor, 5-megapixel camera, Android 1.6, and 16GB of internal storage that can be expanded to 48GB via microSD. Even though it'll be loaded with Android 1.6 out of the gates, there is a Carphone Warehouse listing indicating some good news with an “OTA upgrade available soon.” So there shouldn't be any worries purchasing this thing right away now that it's possible that Android 2.2 Froyo and all of its fancy features are incoming.